We’d love your help. 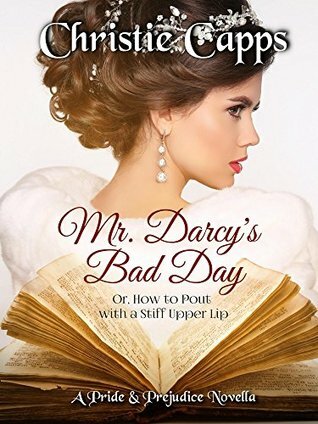 Let us know what’s wrong with this preview of Mr. Darcy's Bad Day by Christie Capps. Based on Jane Austen’s classic novel, Pride & Prejudice, Mr. Darcy’s arrogance and pride seems to be a constant source of bitter frustration to his betrothed. He is surprised to find these less-than-sterling qualities trip himself up a time or two…or three, as well. To ask other readers questions about Mr. Darcy's Bad Day, please sign up. Darcy, in going for a walk when his horse is found to be lame, finds one reason after another to place blame on his situation, his mind's wandering and his subsequent fall...on Miss Elizabeth. In falling, he needs help (He has badly sprained his ankle.) and it is, of course, that young lady who shows up. You may find the fast moving events that follow to be amusing but they also show much about the true "sketching" of character done on both Elizabeth's part and on Mr. Darcy's part. Oh, yes, indeed, we read of a Collins who is quick to say that as his wife Miss Elizabeth will soon learn her role. And Lady Catherine's tongue is not quiet...when she shows up after the main events. Oh, poor Mr. Darcy! He's having a terrible, awful, no good, very bad day, indeed!! You've got to pick this story up and enjoy this offering by a delightful new author in the published JAFF world. Ms. Capps' writing style gives Darcy's thoughts a most unique voice. I don't often LOL even when I'm amused by a book, but this one got me guffawing. Because this is so short, I will give only broad hints as to the opening storyline. Darcy's in Hertfordshire, taking a walk, and he has a fall in the mud t Oh, poor Mr. Darcy! He's having a terrible, awful, no good, very bad day, indeed!! Because this is so short, I will give only broad hints as to the opening storyline. Darcy's in Hertfordshire, taking a walk, and he has a fall in the mud that damages more than his appearance. Elizabeth finds him and brings help, although not the kind he would have preferred and, yet again, his pride takes a beating. Things move from bad to worse to even worse to worst yet, as he is brought to Longbourn and, among various other indignities, encounters Mr. Collins. Mr. Darcy and the Terrible, Horrible, No Good, Very Bad Day. Oh, this was the most delightful, funny and hilarious short story I have read in a while. I laughed so hard, I think I bruised a rib. This was a short, clean, read with a few steamy thoughts but nothing explicit. It was so funny and humorous. There was no angst, no Wickham, not even a Caroline in sight. Although, there was Mr. and Mrs. Bennet, Mr. Collins and Lady Catherine and Bingley of course. I read this in one sitting and I CNPID [ Mr. Darcy and the Terrible, Horrible, No Good, Very Bad Day. Oh, this was the most delightful, funny and hilarious short story I have read in a while. I laughed so hard, I think I bruised a rib. This was a short, clean, read with a few steamy thoughts but nothing explicit. It was so funny and humorous. There was no angst, no Wickham, not even a Caroline in sight. Although, there was Mr. and Mrs. Bennet, Mr. Collins and Lady Catherine and Bingley of course. I read this in one sitting and I CNPID [could-not-put-it-down]. At 88% there was a reveal that took me completely by surprise. I lost it. I simply could not believe the author did this. I laughed out loud. I love it when an author pulls one over on the reader and this was BIG!! Oh, I adored this story. 2nd read: 12-25-18: still love this as much as the first time I read it. Mr. Darcy’s Bad Day is a delightful, hilarious novella by Christie Capps (the pen name of J. Dawn King). Based on Jane Austen’s Pride and Prejudice, the novella finds Mr. Darcy having fallen and injured himself in the mud while on a walk near Longbourn. Elizabeth Bennet finds him in his distress and helps him back to her home, where things go from bad to worse as he must contend with Mr. Collins, Mrs. Bennet, Lady Catherine, you get the picture. One thing follows another, then follows another, an Mr. Darcy’s Bad Day is a delightful, hilarious novella by Christie Capps (the pen name of J. Dawn King). Based on Jane Austen’s Pride and Prejudice, the novella finds Mr. Darcy having fallen and injured himself in the mud while on a walk near Longbourn. Elizabeth Bennet finds him in his distress and helps him back to her home, where things go from bad to worse as he must contend with Mr. Collins, Mrs. Bennet, Lady Catherine, you get the picture. One thing follows another, then follows another, and Mr. Darcy has had a very bad day indeed. I couldn’t help but laugh at his misfortune because seeing the events unfold from his point of view was just so darn funny! Capps does a fantastic job piling on problem after problem but keeping it light and fun throughout. She has no qualms about upending the story and making readers go from laughing out loud to gasping out loud. Mr. Darcy’s Bad Day is short enough to be read in one sitting, as it should be to avoid interrupting the flow. The drama is high in this one, but that makes it all the more hilarious and deliciously sweet in the end. Brava, Christie Capps! Change the quote above to Curmudgeons and Donkeys and you have this book in a sentence! And yet, Darcy constantly smells Lavender. Ah Lavender! Here begins this amusing little tale. Elizabeth is walking (no surprise) and aids Darcy’s journey to Longbourne. He is installed in her bedroom – Lavender – while she shares space with Jane. Thornton, his valet, attends him. Some of the best lines in the book are Darcy/Thornton interactions. Ah Lavender! The man is the perfect valet to a curmudgeon. Enter Mr. Collins! I forget if he is the curmudgeon or the donkey – possibly both! Now there’s a curmudgeonly quote for you! This story ends happily with a different curmudgeon! I am still grinning from ear to ear. This is perhaps the most adorable story I have read or heard in a long time! Christie Capps, you mischievous thing you, what fun this was! Stevie was magnificent as always, this is one that I am going to treasure over and over again. A Delightfully Terrible Bad Day! In an attempt to avoid Caroline Bingley, Mr. Darcy thought indulging in a long ramble outside would be pleasurable and beneficial…Well, several moments later finds him lathered into a pique and sitting in a puddle of muddy water with a twisted ankle. Frustrated at how un-refreshing and unsatisfying his walk had been, Mr. Darcy determines it is all Miss Elizabeth Bennet’s fault. Because the idea of finding pleasure in A Delightfully Terrible Bad Day! In an attempt to avoid Caroline Bingley, Mr. Darcy thought indulging in a long ramble outside would be pleasurable and beneficial…Well, several moments later finds him lathered into a pique and sitting in a puddle of muddy water with a twisted ankle. Frustrated at how un-refreshing and unsatisfying his walk had been, Mr. Darcy determines it is all Miss Elizabeth Bennet’s fault. Because the idea of finding pleasure in long rambles came from her. And just when his day couldn’t get any worse, Mr. Darcy is found in his lamentable predicament and brought help by the one person he is determined to be upset with…Elizabeth Bennet! What a delightful and diverting novella! I love how on the back cover the heading is “Timeless Romance for the Busy Reader” – so true! We all have those days where we could use a little something to distract us from our cares or bring a smile to our face, and this charming story definitely does deliver that! Mr. Darcy’s Bad Day is a fast-paced tale that is told from Mr. Darcy’s point-of-view, and focused solely on Darcy and Elizabeth. What I loved most about this story was being privy to all the adorable and candid thoughts that ran through Mr. Darcy’s head! This Mr. Darcy is a keen observer and I liked how he quickly found many more reasons to admire and appreciate the already more than “tolerable” Elizabeth Bennet. I also loved that this Mr. Darcy often displayed his protective nature. Quite endearing! I read this book after reading the reviews here, so, while I'm not good at writing reviews, I want to write my piece: this book is really funny and adorable. I'm sure people will have a good time with this light and cute story. A delightful, short story with a couple of surprises for Darcy. Great writing style, a lot of humor and entertaining character descriptions. I don't want to spoil the plot, but I had my mouth hanging open twice while reading it. Looking forward to more of this talented author. I LOVED THIS STORY. It was delightful. Short and sweet. I do wish i had more at the end because i never wanted this to end. BRAVO! This is the second adorable and light novella that I've enjoyed from the author and I love her goal of quick reads for the busy booklover. The premise of writing a complete story in under a hundred pages has appeal, but that only works if the story is well-developed with an engaging cast of characters and storyline. Mr. Darcy's Bad Day succeeded with that. The tale is a variation that begins not long after the Meryton Assembly when Darcy said those unflattering words about Elizabeth Bennet that s This is the second adorable and light novella that I've enjoyed from the author and I love her goal of quick reads for the busy booklover. The premise of writing a complete story in under a hundred pages has appeal, but that only works if the story is well-developed with an engaging cast of characters and storyline. Mr. Darcy's Bad Day succeeded with that. The tale is a variation that begins not long after the Meryton Assembly when Darcy said those unflattering words about Elizabeth Bennet that she overheard. The variation begins when he goes on a walk, takes a tumble, and is stuck requiring assistance from Miss Elizabeth Bennet. He has the unique opportunity to learn of his mistake and alter her opinion much sooner than the original story while gaining perspective on his intended, her family and himself. There was a cuteness factor to this one that had me smiling several times. I enjoyed this Darcy and Lizzy, but Benedick the donkey and Darcy's valet Thornton as real scene-stealers. Make a cuppa of your favourite beverage, put your feet up and settle in for a delightful treat. This is a charming novella that has you wondering what has caused Mr. Darcy's bad day. I don't wish to give away too much of this funny and at times reflective story. However, what does a puddle of muddy water, a band of thieves with a leg of lamb and a jug of ale along with a donkey have to do it with? Believe me, you wont be disappointed! This book was a unique look using simplistic ideas. There were no fancy balls, lies, or ridiculous behavior for men in red coats. Darcy is taking a ladies example and testing out the pleasure a fine walk can bring. Unfortunately, he wasn't named Grace for more than one reason. Now injured he meets none other than the inspiration for his journey in the first place, Elizabeth Bennet. The pair lock horns and man was it spirited listening to Darcy's side. There is no way a woman of flesh and blood co This book was a unique look using simplistic ideas. There were no fancy balls, lies, or ridiculous behavior for men in red coats. Darcy is taking a ladies example and testing out the pleasure a fine walk can bring. Unfortunately, he wasn't named Grace for more than one reason. Now injured he meets none other than the inspiration for his journey in the first place, Elizabeth Bennet. What a great, fun story! So cleverly put together. Not a long story, but satisfying. Mr. Darcy goes for a long walk from Netherfield, because during Elizabeth's stay there, nursing Jane, he had noticed how bright and Happy she seemed after her walks. Only if doesn't work out for him as he hoped, as he ended up on the ground from a trip! Now the true fun begins! Truly Great Read! This is a somewhat funny P&P What if that has poor Mr. Darcy so desperate to escape Caro's clutches that he set off on a walk about Netherfield where he falls and believes himself to be transported to Longbourn for recovery and an inadvertent compromise of Miss Elizabeth. For those of us who need a short treat, this is the book for you. Such a fun tale and lol OMG I did laugh out loud as part of the plot reminded me of a plot from the TV show Dallas, a nighttime drama free the 1980s. A delightful book! Thank you! In this Pride and Predjudice variation, Darcy could not have a worse day. He is injured on a walk between Netherfield and Longbourne and is rescued by Elizabeth. He is in pain and is forced to send time with Mr Collins and on and on to the point of hilarity. As part of his bad day consequence, he is forced to come to terms regarding his feelings for Elizabeth and to express himself clearly. It would be irresponsible to say more as it would spoil the story. However, it is well written, kept my at In this Pride and Predjudice variation, Darcy could not have a worse day. He is injured on a walk between Netherfield and Longbourne and is rescued by Elizabeth. He is in pain and is forced to send time with Mr Collins and on and on to the point of hilarity. As part of his bad day consequence, he is forced to come to terms regarding his feelings for Elizabeth and to express himself clearly. I LOVED this book!!! Many, many thanks to Pamela Lynne for the recommendation!!! The twist was most surprising!!!!! I don't want to give it away.....LOVED the path to Darcy and Lizzy's HEA!!! A great, light-hearted, low angst, heartwarming read!! I highly, HIGHLY recommend this book!!! Mr. Darcy is not having a very good day and it keeps getting worse, but the worse it is for him, the funnier it is for us. In this book, while walking near the Longbourn grounds, Mr. Darcy takes a fall and injures himself being found by Miss Elizabeth Bennet, who promptly seeks help to take him to Longbourn and be seen by a doctor. I found the means of transportation and Mr. Darcy’s ramblings about it very funny; in fact, the entire opening pages are incredibly funny. I couldn’t stop laughing or smiling while reading this book, and consider it a very entertaining novella, perfect for someone who wants to have a good time. It can easily be read in one hour and it will for sure give readers a pleasurable time. Apart from the humour, I enjoyed the fact that in this book Mr. Darcy and Elizabeth have intelligent and interesting dialogues, their rhetoric was noteworthy and it made me want to read future books from this author. I also liked to see that both characters came to the rescue of one another in different circumstances. Elizabeth helps Mr. Darcy after his fall, and he comes to her rescue in a very gentlemanly manner when Mr. Collins becomes everything but gentlemanly towards her. As the book is not very long Elizabeth’s character has to go through several changes very fast, but I believe this was successfully done, culminating with her outmaneuvering Lady Catherine in an impressive manner. Summing up, this is a small story that can be read very fast and will for sure make everyone smile. It’s perfect to be read between two longer and more serious books as it is a fresh and amusing story. On Amazon the author describes this book as a timeless romance for the busy reader, and I perfectly agree with her. With so many events happening in our lives we have less and less free time to truly enjoy a longer romance so I really value these shorter stories, and given the quality on this one, I will be looking forward to the next releases from this author. This is a sweet clean novella told from Mr. Darcy is walking the grounds between Netherfield Park and Longbourn, hoping to find the peace Lizzy seems to get from her daily walks. Therefore, he determines it's all Lizzy's fault when he falls into a puddle and injures his ankle. Lizzy discovers him and takes him home to Longbourn to recover. When circumstances find them compromised, Darcy needs to convince his charming Lizzy to overlook his behavior during the last few weeks and give him a chance. It is such a joy to read a clever, fun, well-crafted story in just a couple of hours. The story takes place before the Netherfield ball, and places the fastidious Darcy in a deliciously undignified position after an accidental twisting of his ankle. He is already enamored of Elizabeth, but hasn't quite made up his mind about what to do. A wonderfully funny sequence of events helps him to decide on his future. There are so many laugh-out-loud moments in this book that make it priceless. The time frame is very short, so the number of characters involved is limited to the Bennetts, Mr. Bingley, Lady Catherine and Mr. Collins. In spite of this, the story is well rounded, with plenty of drama to balance out the humor. This was a delightful diversion from a standard length book, being a novella it was rather short, 114 pages, but that didn’t detract from being an enjoyable read. Mr. Darcy has a bad day when he wants to go for a walk but his horse is a bit lame, so he decides to walk. But in doing that he turns an ankle fairly badly and is stuck outside and not knowing how to get help. Miss Elizabeth Bennet comes along and extends him help. This leads to her taking him back to Longbourne and the fun begins. Add This was a delightful diversion from a standard length book, being a novella it was rather short, 114 pages, but that didn’t detract from being an enjoyable read. Add in Mr. Collins being present, Elizabeth’s mother, her rowdy sisters, an overbearing mother and Mr. Darcy in pain and you have quite a story. Darcy is having a bad day. And what does our author give us? Humor! This short story follows Darcy through his day of unfortunate circumstances with chuckles, grins, a few twists and turns and an occasional laugh out loud. A fun read well worth your time. Great wisdom can be learned from religion, from philosophy, or from humorists. But it can also be learned from a dream, an impertinent girl, or sometimes from a donkey. Very funny story. A good walk gone bad and how Darcy learns to be open, joyous, and less proud. I recommend the story highly. Darcy decides one day to take a walk while staying at Netherfield. His first mistake. When he receives an injury and then gets caught in the rain, is it possible for his day to get any worse. An enjoyable well-written romance story. Sweet, fluffy, and very, very funny. I have not giggled over a book so much for quite a while. I wish it was longer though (4/5 stars precisely because of the length). If you need something to cheer you up, this is a very good choice.